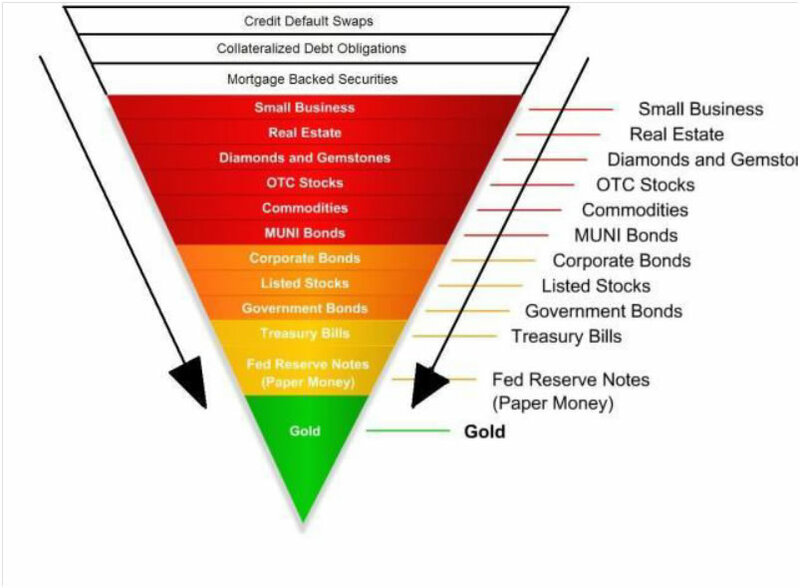 I came across the inverted pyramid below last year which outlines the “asset backing configuration” between gold, cash and all other financial instruments. I decided to try to put some real figures behind this graphic. What I discovered is summarized below. When you review this summary you begin to understand why many are beginning to believe the current “fiat” (Fiat = let it be) money system is becoming increasingly unstable and cannot continue in its present “arrangement”. The one statistic that I discovered which really worries me is the fact that in 18 years total currency in circulation (item 2.) has grown from 1 trillion dollars to the current level of 4 trillion dollars. This has all the hallmarks of hyper-inflation to me and explains the explosion in food, commodity and equity prices world –wide despite lackluster economic performance. 7. Total Value of Assets In The World: 120 Trillion (Managed). On the Dow Industrials, the Dow Transports, the McClennan Oscillator Index, the McClennan Summation Index, the Advance-Decline Line, the market is giving “buy” signals this Tuesday. I attach charts of the fore-mentioned for your review. Technically speaking this augurs well for the up-coming earnings season. Even consumer staples, which have been in a short term bear, gave a gentle bullish break-out signal. As you can see from the chart above, for nearly 20 trading days (4 calendar weeks) the Consumer Staples ETF: XLP had been caught in a tight trading range (a line). I told all my students to closely observe where the “break-out” would occur on this ETF. I pointed out that, on probability, the break-out direction would indicate April’s earning season trend.